When your child first comes along to Beavers you need suitable clothes to run about in. Jeans/shorts, T-shirt, Sweatshirt and Trainers will suffice. Once your child has decided to stay with the 4th Oxford Beavers you will need to purchase a Beaver sweatshirt (plus possibly a shirt). 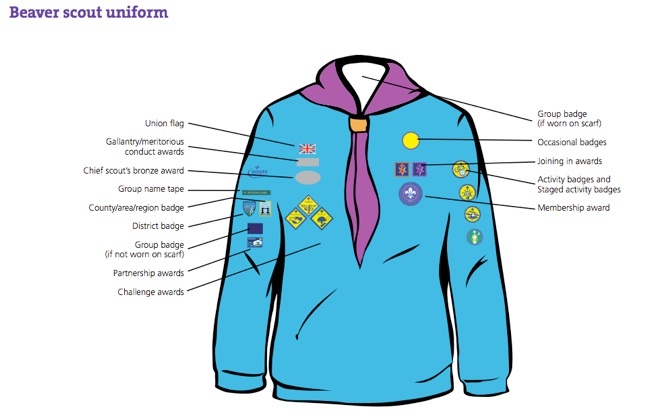 Once your child has made their promise and officially joined Beavers they will be presented with a necker plus a number of basic badges. The image to the right of this page will show you where to put them.